Ant infestations can range from being a minor annoyance to being quite invasive inside and around a structure. The species of ant determines the risks presented when populations grow to infestation levels. Anyone who suspects that they are dealing with an annoying ant species of any kind should call Venice Pest Control for assistance. White-footed ants have become an established and prevalent pest ant in south Florida.Their colonies are usually large containing multiple nests with individual ants ranging from thousands to millions. Nests are mostly found outdoors but this ant often forages inside, especially in kitchens and bathrooms searching for new food sources. Nests may also be found indoors in attics and wall voids. White-footed ants are often seen foraging on trunks or branches of trees and shrubs searching for nectar or sap sucking insects that produce honeydew. Big-headed ants are soil nesting ants and are sometimes confused with subterranean termites because they also create similar debris-covered foraging mud tubes that may be visible on the trunks of trees when these ants are present. These ants leave piles of loose sandy soil and often forage in kitchens, bathrooms and around doors and windows. Caribbean crazy ants are fast and seem to move in erratic patterns. These ants have huge colonies numbering in the hundreds of thousands. They are often seen in wide trails moving fast along sidewalks, driveways, buildings and running up and down tree trucks. Workers will forage in homes and other structures. Argentine ants forage in restaurants, offices, stores, homes and any other location where food and water are available. These ants usually nest in the soil next to buildings. They may make nests in wall voids or in the soil of house plants. Once inside, the ants feed on syrups, sugar, honey and meat. Ghost ants are one of the smallest ant species. Workers measure only one-twentieth of an inch (1.3 mm to 1.5 mm) long. The ghost ant thrives in our semi-tropical climate and will nest indoors and outdoors. These ants are capable of finding food almost anywhere. 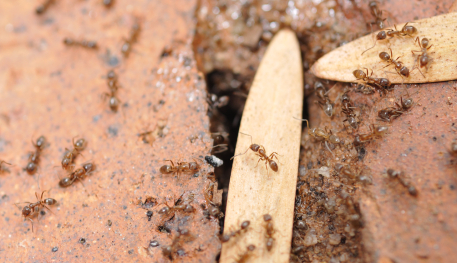 Florida carpenter ants nest in wood that has already been damaged by termites or decay. They do not eat wood, but excavate galleries to tend their young, leaving behind coarse sawdust. Do-it-yourself extermination methods are confusing, time-consuming and ineffective. Venice Pest Control is here to help you get rid of your pest problem for good. Our experienced professionals take care of the entire process of eliminating pests to give you peace of mind. We have been operating in the Venice, Florida area for over 40 years. Contact us today to learn more about our services and to get a free quote!